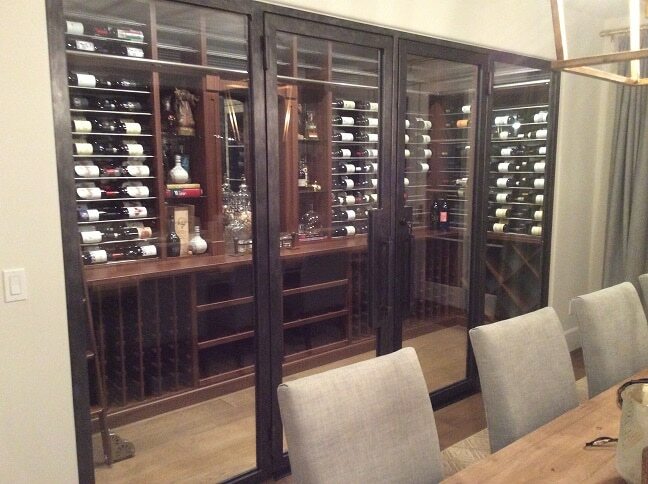 Awesome custom wine room in Orange County, California with cooling unit. 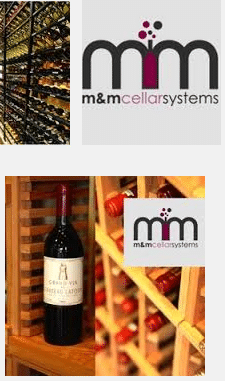 We at M&M Cellar Systems were recently contacted by Vintage Wine Cellars and asked for help on one of their projects. Vintage Cellars is one of the biggest wine cellar builders in the country. Their central office is in Southern California and they do a lot of projects in Orange County and Los Angeles, regularly asking us to assist with cooling unit installation. This impressive wine room was to be built with traditional wood wine racks and modern stainless steel metal rods, merging both old and modern design aesthetics. The entirety of the room would be visible from the outside by large glass walls and doors. 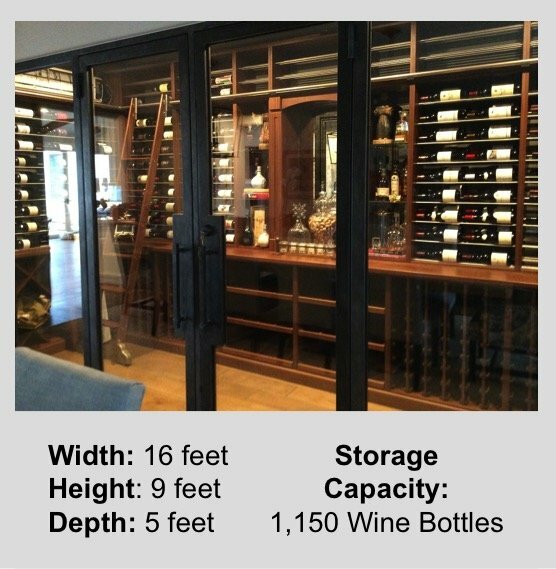 This residential wine cellar measures 16 feet wide, 5 feet deep, and 9 feet high. The total bottle storage capacity is 1,150 wine bottles. Vintage Wine Cellars used a combination of different wine rack designs. There are single bottle storage racks, horizontal display racks, solid diamond bins, case drawers, and stainless steel metal rods. The wine rack designs are actually a mix of traditional and modern wine storage styles. The wooden wine racks are made of Sapele Mahogany. Mahogany is one of the best wood species, due to its natural beauty, longevity, workability, and compatibility with wood stains. The stain used for the wooden wine racks is a dark walnut stain, with a clear lacquer finish. Custom ladder is both helpful and beautiful. A wine cellar door is an essential element in every wine room. In order to maintain the ideal humidity and temperature inside the wine cellar, it must have an air tight seal. This is what wine cellar doors are for–they keep wine cellars insulated while providing a method of access. 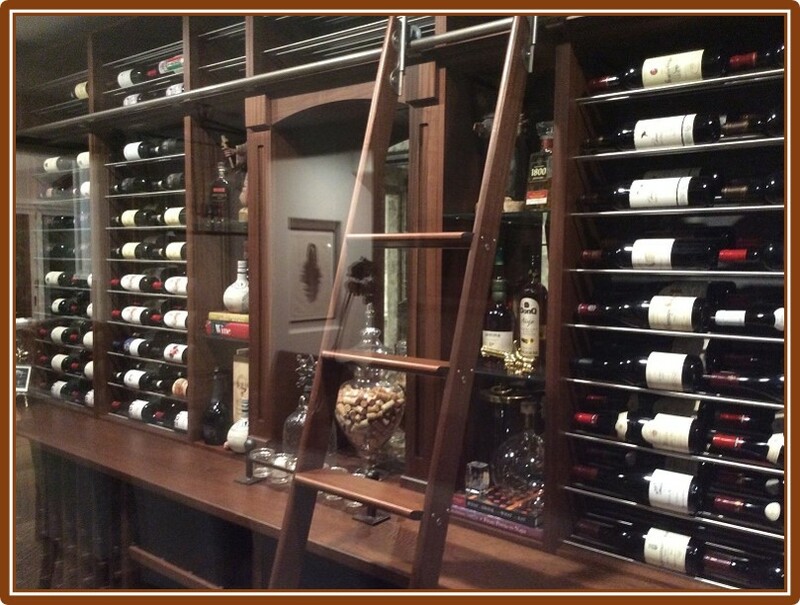 Aside from the functional aspects of wine cellar doors, they should also enhance the aesthetic appeal of a wine room. Wine cellar doors can be customized to reflect the style preference and personality of the owner. The wine cellar cooling unit used for this climate controlled wine cellar is an SLD split wine cellar cooling system. 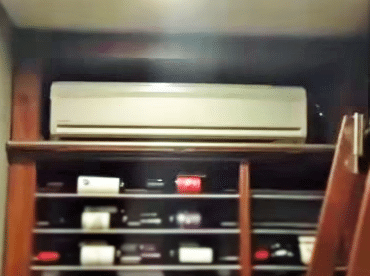 This type and model of cooling unit is ideal for many residential wine cellars. Initially, the wine cellar cooling unit installation was a bit of a challenge due to the size of the cellar and the all-glass-front. At least 10,000 BTUs were needed to cool the room down to 55 degrees Fahrenheit. The first design had a fully ducted commercial grade high static system, which would be installed in the attic. But it turned out that the attic did not have enough space because the air handler for the house was already kept there. This resulted in a redesign that allowed the evaporator coil of the cooling unit be hidden in the wine racks. The split wine cellar cooling system by SLD was chosen for this wine room because of its versatility and functionality. It is designed for medium to high temperature wine storage spaces. 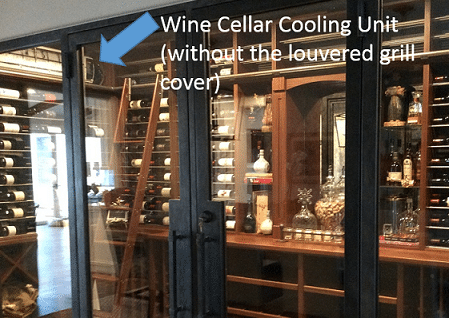 The wine cellar cooling systems team installed the cooling unit horizontally, and covered it with a louvered grill, which was made of the same wood as the wine racks. SLD Split Wine Cellar Cooling System installed in wine cellar, without the grill cover. We at M&M are pleased to offer optional products for this cooling unit. These include the outdoor condenser enclosure and the Ranco digital thermostat. Both are sold separately. M&M Wine Cellar Cooling Systems California is a family owned business based in California. We have years of experience in heating, ventilation and air conditioning (HVAC). We’re also one of the very few HVAC specialists in Los Angeles and Orange County with expert training and experience installing and servicing wine cellar refrigeration systems for homes and commercial properties. We work closely with a number of local wine cellar dealers like Vintage Wine Cellars who need our expertise to complete their wine cellar projects. Contact us now for a free consultation on your wine cellar design and wine cellar cooling unit installation project.